The Yamaha DXR15 is the biggest powered speaker in the DXR line, with a 15-inch low frequency transducer and a 1.4-inch throat compression driver. Both speaker drivers are specially designed by Yamaha and utilize ferrite magnets. The DXR15 delivers 1100 watts of output power, with a frequency of 49Hz - 20kHz. The DXR15 has the biggest bass image of any DXR speaker, and was designed with DJs and dance floors in mind. Use a pair of these to get the party started! Every Yamaha DXR powered speaker has 1 x Mic/Line balanced XLR input with a 10 dB pad. There is also 1 x XLR Thru jack. The 2 x stereo 1/4-inch line level jacks have their own 10 dB pad. After these, there is a 3rd input section that has stereo RCA jacks inputs with yet one more 10 dB pad. There is also a Link Out male XLR port that can be switched between Mono and Stereo modes. All DXR powered speakers are preloaded with Yamaha's unique FIR-X tuning. This uses linear phase FIR filters for the crossover network. FIR-X tuning simultaneously optimizes frequency and phase response, and monitors time alignment between the two transducers. This was Yamaha's solution for obtaining maximally clear response around the crossover point, providing what many feel to be a better clarity and sound imaging than what other speakers can manage. A 48bit high-performance processor onboard allows the DXRs to perform their monitoring continuously and invisibly. All DXRs use high-precision 24-bit A/D and D/A converters. A switch on the rear panel allows you to activate the D-CONTOUR feature on the DXRs. This is an active multi-band compressor that helps yield even more powerful and consistent sound at any dynamic level. It works by continually monitoring the output of multiple frequency bands, and calculating the optimum adjustments to be made to each range. The D-CONTOUR comes with two handy presets that help you get a good tone faster: the FOH/ MAIN mode and the MONITOR mode. FOH/MAIN mode boosts low-frequency to compensate for low-end that is lacking when you are using a full-range setup without a separate subwoofer. MONITOR mode is an optimized preset for floor monitor application, that pulls back on the low-frequencies that create boxy sound reflections. The DXR powered speakers are made from rugged, non-resonant ABS enclosures with no audible vibrations even at the highest output levels. They are fit with heavy-duty steel grilles and ergonomic, gripped aluminum handles. The DXR's pole mount socket offers a second mounting position with a 7-degree downward tilt, allowing you to angle the speakers down from the stage toward the audience, rather than over their heads. 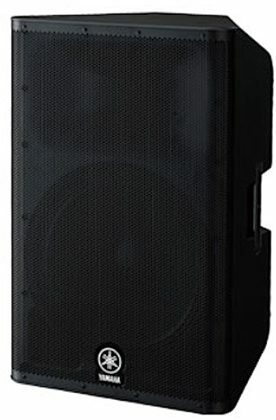 Yamaha DXR15 Powered Speaker, 1x15 in. The Yamaha DXR15 achieves class-leading SPLs and full bandwidth performance by combining a powerful Class-D amplifier with a high-power woofer and Yamaha's cutting edge technologies. Throw in some D-Contour and you'll feel like you're using a subwoofer. Overall: I have used about every type of powered speaker on the market today and I can Honestly say that the Yamaha DXR15 Surpasses all the rest! I would put them up again QSC any day of the week. If you want a great all around speaker with incredible throw these are the speakers for you! Overall: so i perviously owned a pair of qsc k12. great realiable speakers, but needed more throw. did some personal research on the yamaha dxr15 and tried them out at a local guitar center. dxr15 for djing has the throw i was looking for. Great low end and high end without distortions. The speaker is priced at a reasonable price with big sound!